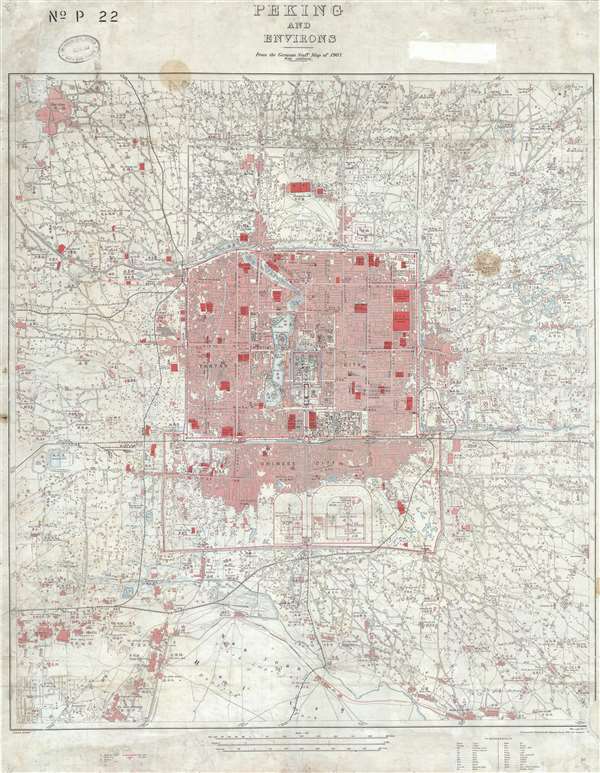 Exceptionally rare large format map of Beijing or Peking drawn after the Boxer Rebellion. Peking and Environs From the German Staff Map of 1907 with additions. This is an extremely rare 1909 British map of Beijing or Peking China drawn prepared by the British Ordnance Survey Office Southampton for the War Office. Cartographically the map is based upon a 1907 German map published in Berlin entitled Peking und Umgebung. This map was created during the period of occupation following the suppression of the 1900 Boxer Rebellion by the Eight Nation Alliance (which included England, the United States, and Germany, among others). While the aftermath of the Boxer Rebellion was marked by rapacious looting and violent reprisals, it also produced detailed survey work, such as the present map, in anticipation of urban management needs and infrastructure development. The only other example we have been able to isolate is in the British Library at S. Pancras. An exceptional rarity. Chart no. 2417. Average. Map exhibits some soiling and edge wear. Repair in lower right corner. Backed on archival tissue. A few stamps and manuscript notes in margins. Additional manuscript identification of place names in Chinese.